For many people who are looking to make their first foray in to the world of budget drones, the expectations of what you can get for very little money may seem to the more experienced drone user a little naive. That being said, in 2019 your money will go further than ever when it comes to buying a camera drone and you might be pleasantly surprised at just how far your money will go if you have not checked out the market in a while. New drone manufacturers crop up on almost a weekly basis and whilst most of them don’t add anything in the way of exciting tech, the increased supply does help to push down the prices of more established manufacturers. Many people set £100 as a rough benchmark when buying their first drone and with most people wanting more than just a fun flight experience we thought we would see what we could get in terms of camera drones for this budget price. We had a lot of fun and some strange experiences along the way and present our results of our top 10 cheap drones with a camera for you in this review. All of the drones on this page come equipped with a camera at a budget price – but if you are looking for professional photography drones then you may need a little more flex in your budget. If you don’t find what you are looking for here then why not check out our top ten drones under £100 – many of which are camera drones. Our old number one camera drone was a bit of a stretch on the £100 budget as it needed a Tec Bean action cam to supplement it. As it had been around 12 months since we originally compiled our list it gave us chance for a refresh and in truth we didn’t have to look far for a new number one. DJI/Ryze joined forces to bring a sub-£100 camera drone to market in the form of the Tello. Modelled very much on the popular DJI Spark, the Tello has been pitched at an even younger audience and/or one that is pretty new to drones. Where the Tello really competes is in terms of its ease of use, range of camera shot types and its battery life. 12-13 minutes of battery life makes it way ahead of the budget drone competition when it comes to integrated cameras and as this sports a 720p HD and 5MP lens it gives the opportunity for some stunning photography for a stupendously low price. Powered by a 12 core intel processor, the Tello is controlled by your smartphone with the intuitive free app. With gesture control and the ability to take selfies in a range of modes (plus stunts and take off from the palm of your hand) this drone is the perfect starter for anyone looking to get in to some form of aerial photography. If you are thinking of a buying a drone but don’t want to break the bank then there is no better purchase than the Tello. 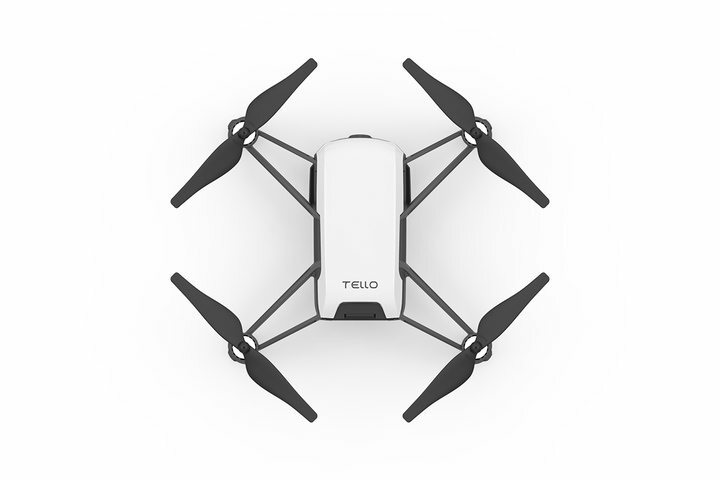 You can read our full DJI Tello review here. Usually if you were to look for a GoPro capable camera drone and wanted to pay anywhere close to £100 or less you would be out of luck. However, DROCON have impressed us beyond belief with their latest Monster Blue Bugs 3 offering which has space for an attachable GoPro camera. What impresses us even more is that you don’t have to go for a GoPro and can in fact substitute a different type of action camera instead. Introducing the Tec Bean 4K Action Cam that is perfectly compatible with the Blue Bugs 3. At the time of writing you could purchase the two together for just over £115 – which is an absolute steal in any book. Not only is the DROCON Blue Bugs 3 our favourite drone on this list (at this price) – it is super versatile thanks to its action cam slot. The drone itself impresses with brushless metal motors that provide un-rivalled flight times (at this price point) of 15-20 minutes! Super steady flight and a range of up to half a kilometre mean you can get some awesome 4K video shots with this drone for a snip of a price. If you need to get even better footage then you can even attach a gimbal to this drone, whilst those needing something speedy will not be disappointed here – this is a true action cam drone that is capable of high speeds. The only downside of this drone is that it is not compatible with the GoPro Hero 5 – however, if you don’t yet have a camera, have a Hero 4 or below or have a Tec Bean action camera then this is the perfect drone to get you started. The drone is very easy to control thanks to a well built and 2-way responsive controller. It is capable of flips and stunts if you fancy using it for that, but in all honesty the camera functionality is what you will enjoy the most on this drone. When it comes to the perfect camera, the TEC Bean could hardly be better – an amazing price, 4K quality, WiFi and waterpoof and a 170 degree wide angle lens make it the perfect companion for your Blue Bugs 3. The DROCON U31W Navigator is very much pitched as a camera drone for children but we think it offers a little more than just being a good starter camera drone. As with anything from DROCON these days, you are getting a decent build quality and a good level of after sales support – the smartphone app is excellent! Not only that, but the technology in the U31W is pretty impressive too – and for this price you can’t complain a dot. Altitude hold, an out of range alarm, one press take off and landing and headless flying mode are all excellent but the biggest pull for the Navigator drone is the camera itself. You get a 120 degree 720p wide angle lens that shoots HD video for fun. Whether you want to use this drone for selfies or slightly more serious matters, the DROCON is capable of performing on many levels. With FPV functionality right out of the box (and the added possibility of using VR goggles with it) thanks to the connectivity with your smartphone, we can hardly recommend this drone enough. The controller is very minimalist, but again is well built and works as intended. Battery life of the Navigator is around 6-7 minutes but you can purchase more for increased flight times. Whether this for the small kids or the big kids – there is more than enough to keep you entertained with this drone. Hubsan is a brand that is not new to most in the drone fraternity and it is probably their industry knowhow that has helped them get the H107C+ model to our number one spot in our best drones under 100 review. At a price point that is comparable to the two competitors on this list the Hubsan exudes just a little more class than its rivals. The H107C+ is not the sexiest looking drone in the world but it is the operational side of the drone that makes the difference. Added to that, the ease of use and the ease of purchasing repairs and this drone could easily find itself in a list of best intermediate drones – not just one that is aimed at beginners on a budget! That is high praise indeed for a drone that costs well under £60. When it comes to flight, the H107C+ is a joy to handle and the controller is really responsive – which makes life easier if you have never flown a drone before. The 6 axis gimbal means that you get super steady flight and there is no problem with taking video footage at high altitude and distance. The 720p HD camera performs well and the only way this drone lets itself down in terms of the camera is that you can’t see what you are pointing it at. If this drone had FPV then it would be immense. That being said, you still get so much for your money with this drone. It would be pretty unfair to compare any of these drones to a GoPro Karma drone or any other drone that is designed for an expensive high end camera for that matter, but the Hubsan performs well in this class of drone and is our top pick. Flight time per battery is going to be around 7-8 minutes when operating the camera and you might get 10 if you are just flying it. The Hubsan won’t leave you high and dry (or low and crashed for want of a better phrase) if you run out of battery, with it powering down just after it performs a safe landing – best not to fly it over water or you definitely won’t be high and dry should you run low on power – we told you we had fun with this test – well I am sure you can guess what happened – needless to say, the Hubsan does not like water very much. If you are looking for a real quality drone for less than £100 and a good camera then you can’t go wrong with the Hubsan. Check the latest price with Amazon here. This is not the first time we have featured a Lamaston drone and it probably won’t be the last. Lamaston come under that bracket of drone manufacturer that excel in the sub 100 category and give you quite a lot for your money when it comes to buying a budget drone. This drone technically shouldn’t really have made the list coming in at over £100 but we found it with a hefty discount bringing it in at less than fifty quid – which quite frankly is astonishing for the amount of tech you get for the equivalent of a few pints down the pub. The Lamaston X5SW-1 comes with a full plethora of extras with a spare battery, extra propellers, a holder for your mobile phone to use as an FPV and even a screwdriver for the DIY shy amongst us. It is completely ready to fly out of the box with the exception of a quick charge to the battery – we charged both at the same time as we weren’t expecting much in terms of flight time. We were pleasantly surprised when we did get our drone in the air that the flight time was around 8-10 minutes per battery – meaning that you were getting 15-20 minutes of flying time with the two supplied batteries – for less than fifty quid – again… this is the 2019 drone world for you! Now before we get too excited lets set the expectations very clear right away. You are not going to win any photography awards with this drone. It has a HD 0.3MP camera and whilst it can deliver HD footage at 640x480 at 25FPS, you are going to struggle to get high quality video footage with anything less than perfect lighting conditions. That being said, the X5SW-1 still has many redeeming features when it comes to the camera. The biggest draw for this drone and what makes it a firm favourite in this list is the mobile app that turns this drone remote in to a full FPV camera drone for under 100 – again, quite amazing! The app is free to download and you do so by scanning the QR code in the manual. You clip your mobile phone on to the controller and away you go with FPV over WiFi. The software and hardware works pretty well in this respect and although you can’t control the camera it really helps having the FPV feature when taking video and trying to navigate you way around. The Lamaston gets a solid and respectable 4 stars from us. When it comes to budget drones Syma has the market pretty much all sewn up and the X22W nano drone is another great example of why people love their drones. If you are on a tight budget but still want some fun in your ‘fun’ctionality then the Syma X22W is going to be a good option for you. This drone is not going to provide you with the same quality of video and imagery as our number one DROCON drone when paired with a 4K camera, but this is going to cost you around a third of the price and is going to give you a great introduction to FPV drones – if that is what you are looking for. You can expect around 5-6 minutes flight time from this FPV drone when using it with the camera and the smartphone app. You simply attach your phone to the controller (controller comes supplied) and fire up the Android or iOS app on your compatible phone. You can even draw out your route on your phone screen and the X22W will take that route – this is a feature that is usually reserved for the more expensive quadcopters. Not only can you use your phone to fly your drone but you get real time relay of the video your drone is taking. This means you can fly true FPV using your phone as a screen. Your phone can also be used to store the video that your drone is taking so there is no need for extra storage options such as micro-SD cards etc. The drone has all the usual features you might expect when it comes to piloting including altitude hold and headless flying mode which makes it easier to control your drone as a beginner. If you want a top cheap camera drone then you will go a long way to find one better than this at such a low price. Strictly speaking, the Potensic F181 quadcopter is a little over our £100 budget for this list, but we couldn’t resist adding it as it is more of a package than just a standalone camera drone. This is also the only drone on this list that comes with its own monitor and thus giving a sensational FPV experience that is unparalleled on this list. If FPV is your thing or you like the idea of drone racing then the F181 is the drone for you. This package comes with a sturdy carrying case that fits the drone, controller, monitor, spare blades and the 4 batteries that come bundled together. You also get some tools and a 4GB memory card for storing video and images with this package – and of course a charger. Flight time per battery is around 7-8 minutes, this means you can enjoy around 30 minutes of continuous action with the F181 with the batteries that come supplied – you can purchase more quite cheaply if you feel that is not enough. Charging time for each battery is around 45 minutes but this isn’t really an issue if you are well prepared. The camera on the Potensic is a 720p 2MP HD camera and whilst it might not have the greatest specs it actually performs pretty admirably. In well lit environments it will provide a perfectly clear FPV transmission and even in lower lit indoor areas you will find you can navigate fairly easily using FPV. In terms of flying this drone, beginners and intermediates will be quite happy and will be able to get to grips with the controls fairly easily. One touch take off and landing makes this part of the flight very easy, whilst a non-stepped speed control that goes from 0-100% means you can literally control the drone at the speed that works for you. Altitude hold is one of the best we have seen and allows you to take some excellent video and photographs from a super steady position even when at great height. If you want FPV and have a slightly bigger budget then this is a great choice of drone – if you are looking for a cheaper FPV quadcopter then skip to the next on our list. The Hugine 6 axis RC drone is a child friendly, beginner friendly camera drone. It will not win any awards for its design and likewise its photography and video quality are not going to cause any major blows to other drone manufacturers – but if you are on a tight budget and want something that is going to be pretty robust but still have some decent functionality then this 5 star rated product (on Amazon) might just be the ticket. The controller is fairly comfortable to use and is equally easy to use. You can attach your smartphone to it and use it as an FPV screen in conjunction with the 0.3MP on board camera. This is only really useable in well lit environments and will be quite testing in lower lit indoor rooms. You can pictures and video with the touch of a button and you will also find that the controller allows for some pre-programmed flips and rolls. You will enjoy 5-6 minutes flight time from a single 45 minute charge with this drone, but one disadvantage this drone has is that it does not have a detachable battery meaning you have no way of increasing your flight time. If you want a cheap camera drone for kids or a first foray into FPV without the worry of breaking your drone then this is a good option. One of two Potensic drones on our top ten list, the UF42W is the cheaper of the two but still performs admirably. In fact, it could be a better purchase than the more expensive bundled package if you are looking for a good quality option as your first FPV drone experience. This drone still comes bundled with two batteries, spare blades, the controller and tools for repair and although it doesn’t come with a display for the FPV like our other Potensic drone, it does allow you to connect your smart phone for a true FPV experience. You can even use your phone with some FPV goggles for an even truer first person view experience. You can expect 6-7 minutes flying time from each battery which is doubled as you are getting two with this package. Charging time for the batteries is around 60-70 minutes which is a little longer than we’d like but as you get two it negates the problem. The 640x480 camera takes some good footage and you can record directly from the controller. The quality of video and imagery is surprisingly good and you will be able to impress your friends with the footage you take. If you want to challenge them to a race the the UF42W will be more than up to the task and thanks to the FPV functionality you will be whizzing past them in no time. If you are a beginner or looking for added functionality then you won’t be disappointed as this quadcopter has one touch take of and landing and an excellent altitude hold function. The Top Race TR-Q511 drone is one of those that you won’t hear being talked of much over the UK but it is a drone that we rather took a shine to when testing these sub-100 price drones. This one is typically priced at around £89.99 but at the time of writing we were able to find it for just £49.99 here bringing it well below budget. Now don’t get too exciting by the name, Quad Cam refers to it being a Quadcopter as opposed to it having 4 cameras, but the one it does have does a pretty decent job. The Top Race TRQ511 comes equipped with the controller, battery and a few extra parts and essentially has everything you need to get up and flying. The addition of 2GB SD memory card is quite a nice touch and it also includes an adapter for easy insertion into which device you might wish to transfer your pics and vids. From a 90 minute charge you will get around 8 minutes of flying time which is standard at this price point but also worth the purchase of an extra battery. Unfortunately, one of the drawbacks of buying a brand such as Top Race is that you are going to struggle to find spares easily. The image quality of the TR-Q511 drone was pretty decent and has the same output as the Lamaston but with 30FPS instead of 25. Images appeared pretty crisp in good light but were a little grainy in low light. The lack of FPV did bother us but the flying ability and the sheer coolness of design did win us over when it came to the Top Race. The flashing LED’s look good but what really got this drone to number 2 on our list was the steadiness of shot when it came to recording the 720p HD video – it was far superior to the slightly shaky Lamaston. We give the Top Race TR-Q511 a worthy 8.5/10 (if you can get it for £50) – check the latest price here. We kick off our top ten camera drones with an excellent offering from Beebeerun. One of the most durable drones on this list, it is almost indestructible and makes it an excellent choice for beginners and younger drone users alike. This 6-axis quadcopter has full FPV functionality and connects to your smartphone via the supplied controller and the downloadable app to give you real time display of the video captured by the drone. If you like, you can go one step further in to the world of first person drones and use a VR headset or goggles to get a real FPV experience. The BeeBeeRun is extremely easy to fly and comes with headless flying modes for ease of use. It features one button take off and landing and can also perform some flips and rolls at the press of a button. At just 9 by 9 inches, this FPV drone might look like an insect but it flies like a beast and with up to 10 minutes flying time it can outlast many of the drones on this list from a single charge. The camera on this drone is pretty impressive but is by no means the best on this list. If you want improved quality then you should perhaps read on, but if you want something solid that is almost impossible to break then this is an excellent place to start – it also features a one button return to home if you get in trouble! When it comes to camera drones there are few things that are more important than the camera itself. However, you can have the best camera with the worst flight and you will never get a good photograph or video. Luckily, the DROCON Blue Bugs 3 has enough quality in every department to give a beginner (and even an intermediate) drone user a great experience.